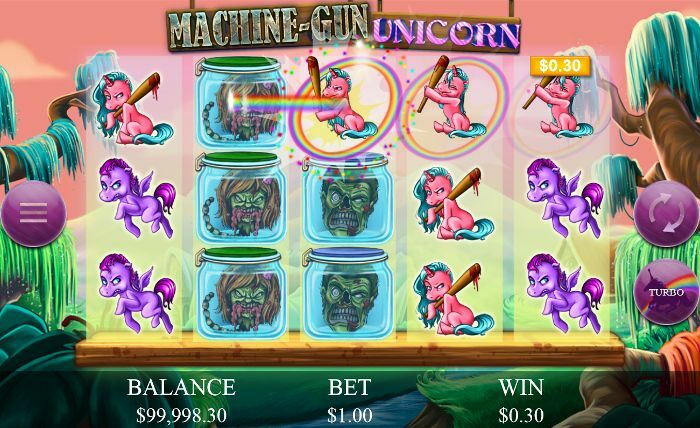 Starting today, you can play Machine-Gun Unicorn at Pokies.com. This is one of the weirdest, most fun online slot games ever created. Saying that Machine-Gun Unicorn is a unique game would be quite an understatement, after all we’re talking about a game where the hero is a unicorn with a machine gun for a horn. The game’s creator Genesis Gaming calls Machine-Gun Unicorn a “horror meets humor” game. That’s a good description of a game that features not only unicorns, but also colorful zombie heads floating in jars (yes, really!). The game’s back story goes like this (it’s better we quote this, as we don’t want to accidentally ruin any of the story’s subtle nuances): “the zombies have invaded Ponyland, and only the Machine-Gun Unicorn can help the magical creatures fen off the invaders”. So zombies, unicorns and magical creatures duke it out on the reels. To really immerse yourself into the story you can read the story in a comic book form). The game itself is a fast-paced, five reel, 10 payline game with a return percentage of 97.187%. It features many innovative game-play mechanisms, including Symbol Bombs™. Get a winning combination with Machine-Gun Unicorn symbols, and any Zombie-symbols on the reels will literally be blown away. As if all this madness wasn’t enough, Machine-Gun Unicorn is just one of four new Genesis releases added to Pokies.com today. The other three slot games are a little bit more normal: Clash of Queens is inspired by fairy tales, Gods of Giza is yet another ancient Egypt game and Robyn is a “lady Robin Hood” game. You can play all the new games your computer and mobile devices (iPad, iPhone and Android devices). If you are new to Pokies.com, join now to get a free $/€/£5 to get a taste of what the best real-money gaming action feels like. If you are already a member, sign in to get play the latest releases.